The documents on this page aid music practice, performance preparation and other sorts of creative work. Feel free to download and print them for educational and self-study purposes but please don’t share, post or republish them without my permission. Document your practice goals in the 5 practice zones. A simple but powerful planning tool! See pages 6-10 of The Musician’s Way. Along with an electronic calendar, a paper schedule helps many of us boost our productivity. Print out this chart and then mark the times when you’ll practice. Note when you work and what you achieve, as described in The Musician’s Way, pages 7-11. Especially helpful when modifying your practice routine. Check off each day that you practice specific titles. Excellent over the short term when changing habits, routines, or teachers. 32 true/false statements to assess your practice habits. Excerpted from Chapter 5 of The Musician’s Way. Gauge your expertise with performance skills. See Part II of The Musician’s Way and the Music Performance articles on The Musician’s Way Blog. Create a visual chart of your daily practice. How a student used a graph to manage and increase his practice time. Plan details over weeks or months. 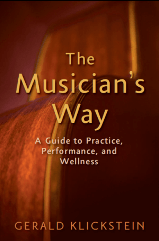 See a sample on p. 218 of The Musician’s Way. Ensure that you and your equipment are ready before you depart for an event. Pages 157-163 of The Musician’s Way provide a description and model. For additional help to advance your musical skills or career, contact Gerald Klickstein to discuss possible coaching via Skype. Subscribe to The Musician’s Way Newsletter.